published by Dutton in 1941. 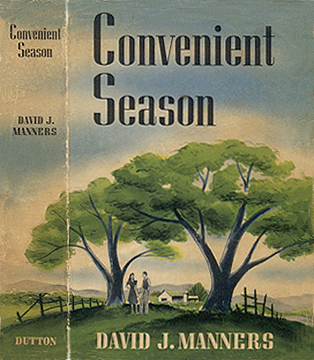 David Manners' first novel, Convienient Season, published in 1941, was hailed as a "romance in the best sense of the word, an exceedingly readable story, rich in the reality of real people and real land." Mr. Manners, said one critic, "has an outstanding dramatic record behind him, including a year on Broadway with Helen Hayes, but if this first novel is to be considered a criterion, then we predict that he has an even more outstanding literary career ahead."  from the front flap of Under Running Laughter, David Manners' second novel.